I'd like to see flight options, too. Enjoy the shores of the Mediterranean at their maximum on Maxx Royal Belek Golf Resort’s 300 metre-long beach, with a jetty featuring cabanas built on the sea, a special beach bar, and elegant sun beds. Tangerine Beach Club, offering beach bar service by day and vivid parties at night, also provides a range of drink options for those seeking a cool, refreshing break between swims. Cabanas located on the jetty and the beach offer you a bespoke world of elegant design and luxe ambiance. Feel special with privileged services and chilled fruits. Ranging in size and equipment, our indoor and outdoor swimming pools offer a pure pool pleasure during all four seasons to those who prefer the pool to the sea. The 1.40m-deep main pool, which is Maxx Royal Belek’s largest pool, serves adult guests throughout the day with an expansive sunbathing terrace, elegant sun beds and a snack bar. The 1.40 m-deep indoor pool situated in the Aven Royal Spa area provides a mesmerizing atmosphere and a leisurely swimming experience to guests in all seasons. The 40 cm-deep kids’ indoor swimming pool at Aven Royal Spa, one of the special corners of Maxx Royal Belek, offers a fun swimming experience for little ones. Maxx Royal Belek’s 1.40m-deep outdoor swimming pool is fed with specially treated seawater - a unique experience for anyone who craves a salt water swim. While little guests are having fun in the 40 cm-deep pool adjacent to Maxx Royal Belek’s main pool, parents enjoy peace of mind and the convenience of checking on their kids at any moment. Maxx Royal Belek’s 2m-deep adults’ pool is reserved for guests who are 16 years and older, offering a deep-water swimming experience ideal for professional swimmers. One of Maxx Royal Belek’s most enjoyable spots, the 1.60 m-deep terrace pool offers Terrace Family Suites and Terrace Laguna Family Suites guests. The 40 cm-deep kids’ terrace pool is at the service of our little guests staying at the Terrace Family Suites and Terrace Laguna Family Suites. The 1.40 m-deep relax pool – set in a calm oasis far from noise – provides peaceful pool time to guests who are 16 years and older. Cobra Kingdom - opening the doors of a fun-filled world - invites you to an exciting journey with its special design and unique sliding tracks! 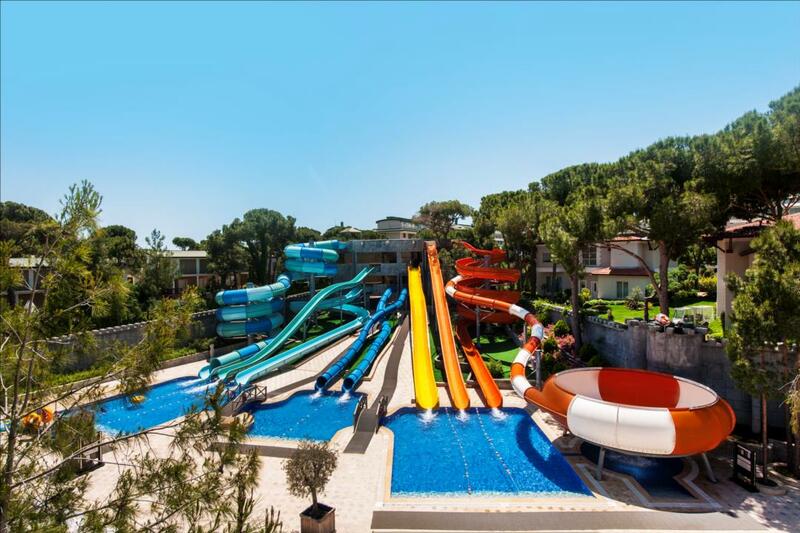 Don’t be late to push the limits of fun with slides of different sizes ranging from King Cobra, Black Hole (130 m), Body Slide (94 m), Turbolance (27 m), Freefall (35 m), Rafting Slide (53 m), Flying Boats (35 m), Kamikaze (31 m), two Twisters (32 m), and Space Hole (31 m). Please fill up the form below if you would like to learn about news and campaigns firstly regarding Maxx Royal world. Please enter your personal data which is very valuable to us. In case you do not want to receive emails from us please contact crm@maxxroyal.com, the newsletter will be terminated in 3 days at the latest. Please specify your communication preference so that we can contact you. Tickets for package tour sales Ets Ersoy Turistik Servisleri A.Ş. Is ticketed by.